지혜로 중생의 어리석음을 없애준다는 대세지보살로 연꽃대좌 위에 앉아 있는 작은 금동상이다. 머리에는 꽃무늬와 갖가지 보배로 화려하게 장식된 보관(寶冠)을 쓰고 있으며 정수리에는 상투 모양의 머리(육계)가 큼직하게 표현되었다. 보관 정면에 보병이 새겨져 있는데 이는 오른손에 들려있는 경전과 함께 이 보살상이 대세지보살임을 알려준다. 신체에 비해 작은 얼굴에는 은은한 미소를 띠고 있으며 세련된 모습으로 탄탄한 인상을 준다. 신체 또한 매우 탄력적인데 가슴은 양감있게 표현됐으나, 허리와 배는 거의 구별되지 않게 하여 날씬한 모습이다. 자연스럽게 흘러내린 옷자락은 등에 짧은 스카프로 표현되었으며, 가슴까지 바싹 치켜 입은 치마는 정면에서 주름을 지게하여 띠를 매고 있다. 퍼지는 치마를 매기 위해 허리에 또하나의 띠를 묶은 것이 특징적이이며 온몸에 크고 화려한 구슬 장식을 휘감고 있다. 대좌는 연잎이 3겹으로 중첩된 연꽃대좌인데, 연잎은 테두리에 단이진 특징적인 모습이다. 불상의 얼굴표정, 날씬한 허리, 치마의 주름단과 허리띠, 전신의 구슬장식, 연꽃무늬 등을 종합해 보면 14세기 말 내지 15세기 초의 보살상으로 추정된다. 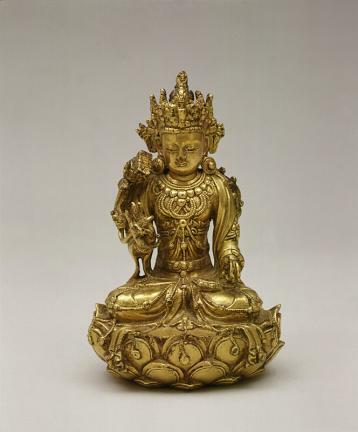 Mahasthamaprapta Bodhisattva is known to relieve people of foolishness; this small, gilt-bronze statue depicts him sitting on a lotus pedestal. He wears a crown that is magnificently decorated with flower design and various jewels, with a large usnisa on top of his head. 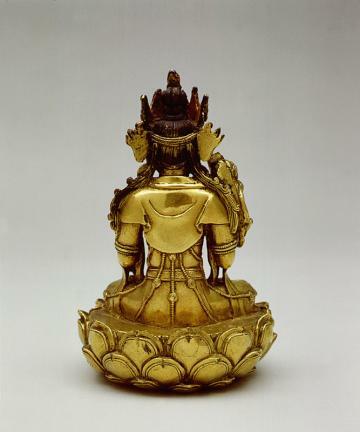 A Buddhist bottle is carved in the middle front of the crown, and the Bodhisattva holds a scripture in his right hand. 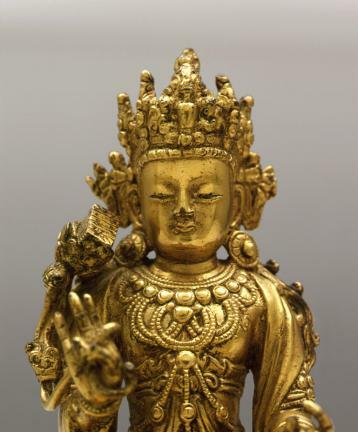 He has a small face compared to the body and a calm smile, with the refined shape giving an impression of balance. The body is also very resilient, and the chest is expressed in a very voluminous way. Note, however, that the waist and belly are so slender that it is impossible to distinguish them. The robe, which naturally hangs down, is expressed with a short, jacket-like scarf on the back, and the skirt raised up to the chest ties into a belt by forming pleats in the front. What makes it special is that another belt is bound in order to tie the drooping skirt, with large, magnificent bead decorations put on the entire body. 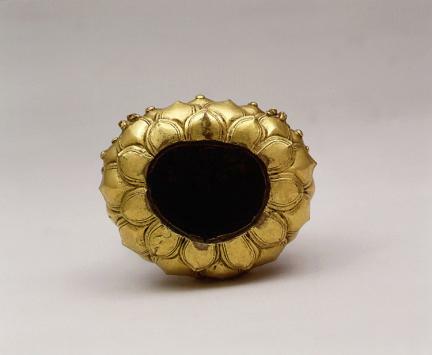 The pedestal is carved with three layers of lotus leaves, which have a tiered edge. 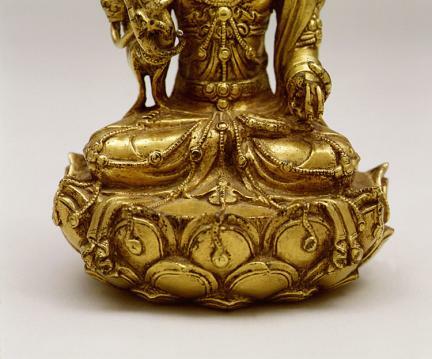 Considering all the characteristics such as the look of the Bodhisattva, slim waist, pleats, belt, bead decorations all over the body, and lotus design, it is estimated to have been made between the end of the 14th century and early 15th century.